Before we get into the nitty-gritty of setting up Rich Pins, let's take a minute to talk about what Rich Pins are, and why you need them. If you're new to the world of Pinterest, take a second and read over my Pinterest 101: The Basics post - it'll clear up all the Pinterest lingo and bring you up to speed on the basics. Rich Pins are basically turbo-charged pins. 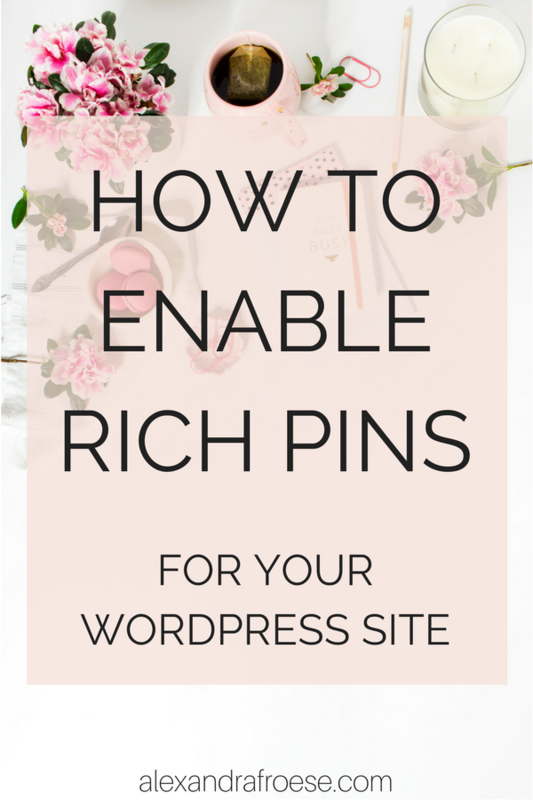 Enabling Rich Pins is super easy, and is incredibly valuable towards growing your Pinterest following. Rich Pins won't change the image on your Pin, but it will change the way Pinterest displays the information underneath your pin. Regular Pins have a simple, plain old description. Rich Pins have a bolded title they pull from the website/blog post. The bold text is much more eye-catching, so Rich Pins stand out in the sea of pins. Once you've enabled Rich Pins, every pin that links back to your site is automatically a Rich Pin - even if it's not you pinning it! And the Rich Pin format is applied to all your past pins, too. How handy is that?! There are four types of Rich Pin: app, product, recipe, and article. Product pins include pricing, availability, and info on where to buy a product. Recipe pins show serving sizes, cooking times, and ingredients - perfect for someone like myself who needs to know whether or not a recipe is allergy-safe. Article pins are great for bloggers - they show a headline, author and story description. App pins have a button to install an app without leaving Pinterest - currently available on iOS only. Why Do I Need Rich Pins? Honestly, the better question is WHY NOT? 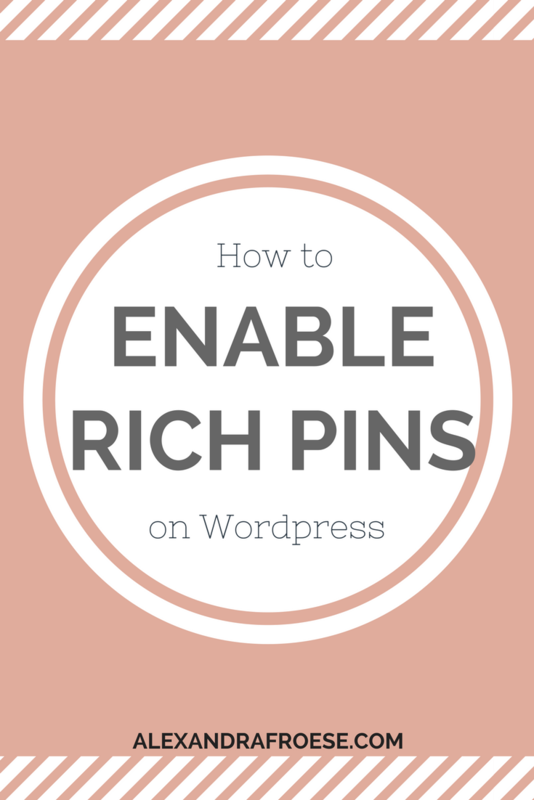 Enabling Rich Pins is so simple and brings so much value to your Pins. While regular pins only show a user-written description, Rich Pins pull that information directly from your website. It ensures that, no matter what future re-pinners add to the description, your information will show up correctly and prominently. Setting up Rich Pins is actually incredibly simple. Just as a heads-up: This method is for Wordpress.org self-hosted blogs - if you're on any other platform or not self-hosted, this WILL NOT work for you! Step 1: Install the Yoast SEO Plugin. In order to set up Rich Pins, Pinterest requires you to add meta tags to your site. Because I'm not a website developer and am slightly terrified of messing around with my site's coding, I much prefer the option of having Yoast do this for me. Once you install and activate Yoast, head over to the "Features" tab, and check that the "Advanced settings pages" switch is on "enabled". That will enable the metadata. Next, head over to Pinterest's Rich Pin Validator and enter in the link to any of your blog posts. It doesn't matter which blog post - any will work. You only have to do this once, so don't be picky. Hit "validate". After you click validate, you should see a message that says "your pin has been validated". Click on "apply now". You'll see a popup with your domain and "HTML tags" selected. Click on "apply now" again. Now, the fun part - waiting! It can take up to a few days for Pinterest to approve your application. After approval, your pins will all display your site's name and favicon. Now that Rich Pins are enabled, you can start creating images, templates, and Pins for your original content. Get Pinning! Feeling overwhelmed? I'd be happy to help you set up your Pinterest account.